The ubiquitin-dependent degradation of membrane proteins via the multivesicular body (MVB) pathway requires the Endosomal Sorting Complexes Required for Transport (ESCRT). This molecular machinery is composed of five distinct multi-subunit complexes. On the surface of endosomes, ESCRT-0, -I and -II bind to ubiquitinated membrane proteins, while ESCRT-III and Vps4 bud intraluminal vesicles (ILVs) into the lumen of the endosomes. By working together, ESCRTs package membrane proteins into ILVs and thereby generate MVBs. The fusion of mature MVBs with lysosomes delivers ILVs into the lysosomal lumen where the membrane proteins are degraded. Besides generating ILVs, the ESCRT machinery mediates for topologically related membrane budding processes at the plasma membrane and the nuclear envelop. 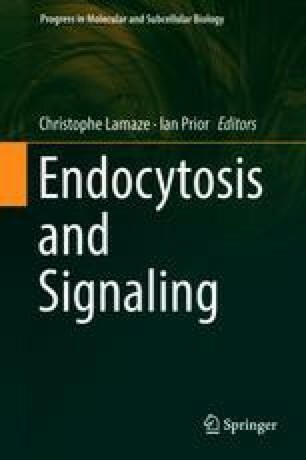 In this chapter, we briefly discuss membrane protein ubiquitination, endocytosis, and summarize current knowledge on the ESCRT machinery in the MVB pathway.